Now, here's a band with a mission. Little Feat is hewn from the same piece of oak as the Byrds, the Band, and the Flying Burrito Brothers. Like those three great (or once-great) groups, Little Feat is preoccupied with American myths and folklore, though in its own peculiar way. This preoccupation is evocatively evident in the group's two albums, Little Feat (one of the three or four best of 1970), and the new record, Sailin' Shoes. 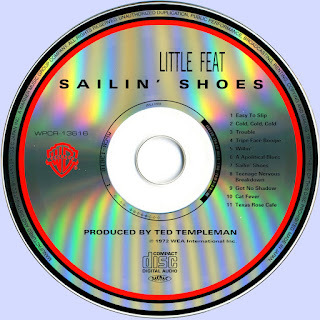 Because of the thematic consistency of Little Feat's recorded work, the two albums must be looked upon as a continuum; there may be more piano on the first and more guitar on the second, but the body of concerns is the same. And the group's approach to its mythic interests follows the same pattern on both LPs. Rather than telling stories in a literal sense, Little Feat's songs flash a myriad of fleeting, haunting images, appearing with all the vivid suddenness of floodlit roadside billboards zooming past an open car window. These albums are virtual treasure chests of haunting associations, sketches, and scenarios. It isn't merely the words, of course, but also the proud, powerful way they're driven across. Lowell George and Bill Payne don't stop at being the writers of virile, touching songs–they're also masterful musicians. Payne plays a cool, elegant piano and a hot, whirring organ. George makes his slide guitar howl and roar like a tractor trailer in the midst of a steep, mountainous descent. George illustrates the muscular mating of men and their machines, while Payne celebrates it. Together with former Mother Roy Estrada on bass and Richard Hayward on drums, they compose one super rock 'n' roll band. Little Feat can play steaming hot, iron-ore heavy, over-easy light, or non-stop speedy, as the occasion demands. They never sound pretty, but there's an unmissable beauty about their rough-around-the-edges designs. Vividly representative of what Little Feat is about is "Willin'," a song so fine they did it twice, once on each album. On the first album, they made the song, written by George, a heroic depiction of the long-distance trucker, a dark, solemn expression of purpose. George sang in his deepest, most tired voice, and the band left the track virtually empty, with only the strumming of a lonely acoustic guitar, until the last section, when Ry Cooder's razor-sharp slide guitar sliced through the emptiness like highbeams on a flat, empty highway. This time, however, they've dressed it up in bright, heroic colors, with George using his high, urgent voice to play the trucker's part, and rich harmonies flapping like banners over the song's most celebratory passages: "Just give me ... weed, whites, and wine,/And show me a sign, And I'll be willin' to be movin'." That Lowell George must've done some driving in his time–or dreamed of it. At any rate, it's a proud, wonderful song, encapsulating a wealth of mythic-heroic elements, from Duke Wayne way back past the Indian Scout and the pathfinder. 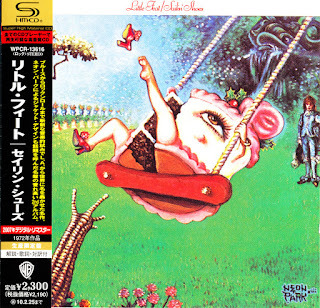 But it's primarily contemporary myths Little Feat is involved with–and living folklore. Sailin' Shoes, interweaving its big trucks, seedy hotels, and greasy spoons with songs about rock 'n' roll, seeks to incorporate this special music into the raw, vibrant, and vast setting of mythic America. The band forcefully shows how well this music, with its mixture of the primitive and the technological, fits into the scheme of things. And they do it with a vengeance, playing like bloody murder, brutalizing but at the same time exalting their equipment, in much the same way the trucker both batters and romanticizes his machine. Each knows his machine helps make him what he is–completes him. All songs by Lowell George, except where noted.